With the 2019 NFL Draft fast approaching, executives and fans alike are starting to turn their attention to the most important position in all of team sports – the quarterback position. 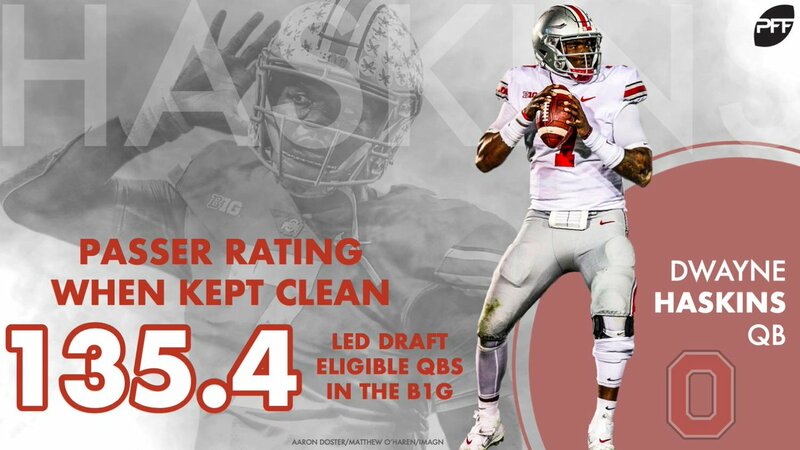 Using the vast array of player grades and advanced statistics that are available in PFF’s 2019 NFL Draft Guide, here are our top-five quarterbacks in the 2019 NFL Draft. 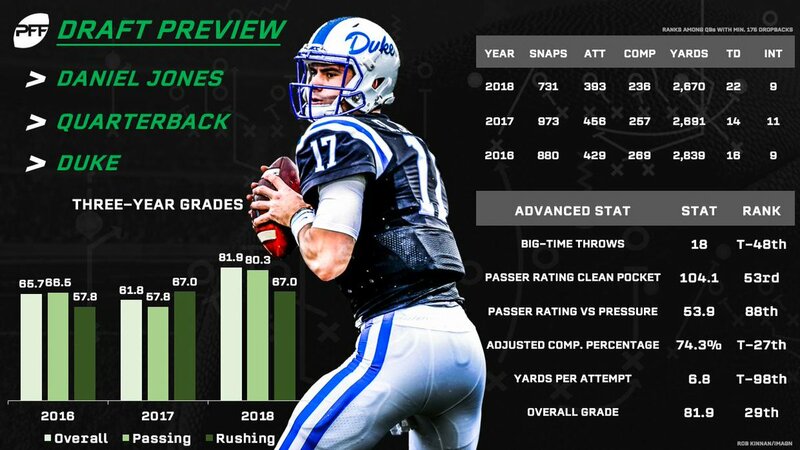 Duke quarterback Daniel Jones isn’t a finished product by any means, but his ceiling has some pushing him into the first-round conversation. He finished the 2018 season ranked 31st in overall grade and 32nd in passing grade, but he still needs significant improvement when it comes to passing the ball under pressure. Coming in at number four it’s Drew Lock of Missouri. Lock has quite the deep ball, as he ranked second in the FBS in deep passing grade this past season. He also ranked inside the top 15 in overall grade and passing grade among his peers. Coming in at number three is West Virginia gunslinger Will Grier, who has earned high grades in his college career due in large part to his deep ball. Last season, he ranked fifth in the FBS in deep-passing grade at 96.4, and third in overall-passing grade at 91.2. Coming in at number two, it’s Ohio State’s Dwayne Haskins, whose 2018 breakout season vaulted him towards the top of the class. While he finished the year ranked third in passer rating when kept clean at 135.4, he needs to improve under pressure, as his 73.2 passer rating under pressure was good enough for only 13th among draft-eligible players at the position. Oklahoma phenom Kyler Murray is the obvious choice for the top quarterback in this class when you consider his high-end production at the college level. He finished the 2018 season ranked first in overall grade and passer rating when kept clean, while he finished second in rushing grade across a large sample size. Murray’s 94.6 overall grade in 2018 is tied for the best grade we’ve ever given a quarterback in the PFF college era, a mark that ranks ahead of top-notch college seasons from Russell Wilson and Marcus Mariota.